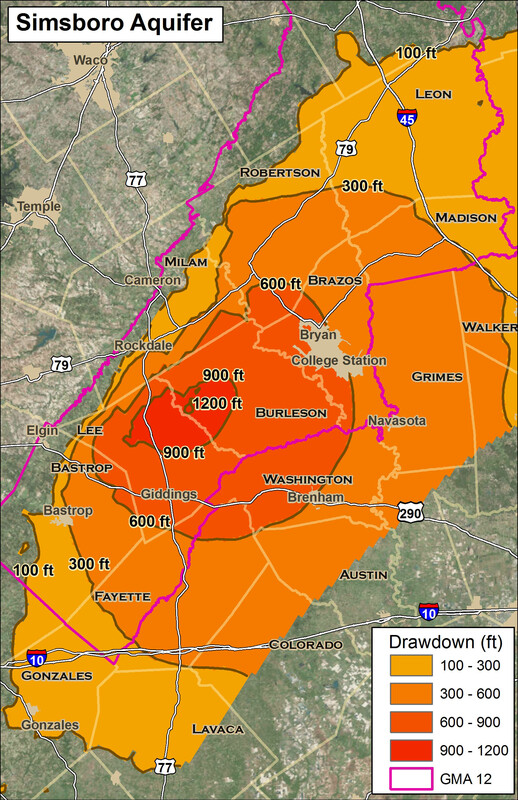 The combined pumping in the Simsboro Aquifer is predicted to cause 900 to 1200 feet of drawdown in Burleson and Lee counties by the year 2060 according to groundwater modeling conducted by professional hydrologist George Rice (Click here for Rice Report March 22, 2016). 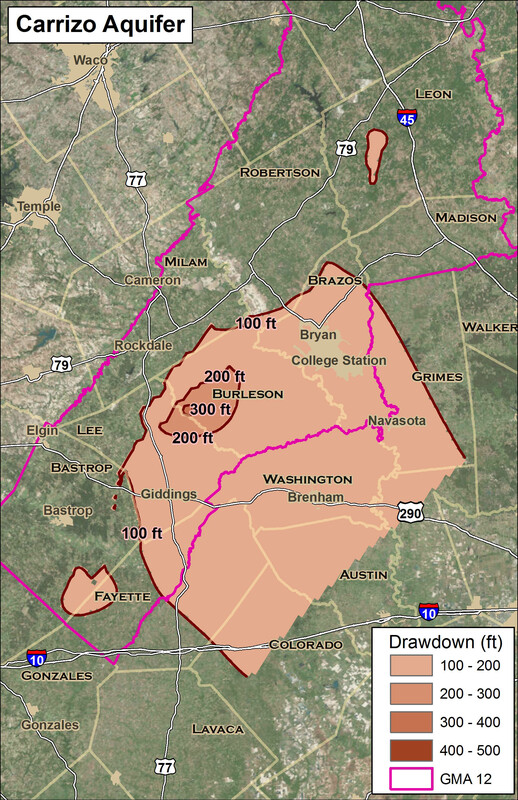 The affects of groundwater pumping within Lost Pines and Post Oak Savannah Groundwater Conservation Districts (GCD) are predicted to impact not only the Simsboro Aquifer, but also the Carrizo, Calvert Bluff and Hooper aquifers extending to points as far away as Gonzoles, Lavaca, Colorado, Austin, Grimes and Walker counties. These aquifers are hydraulically connected throughout the Carrizo-Wilcox Aquifer Group. More than 200,000 ac-ft/y.r of permits and deals are in play. On top of about 90,000 ac-ft/yr of other permitted (baseline) pumping. Significant communication between the Simboro, Hooper, Carrizo and Calvert Bluff aquifers in the Carrizo-Wilcox Group. Significant drawdown in the Hooper, Carrizo, and Calvert Bluff aquifers from anticipated pumping of the Simsboro Aquifer. Permitted (baseline) pumping plus additional planned pumping is predicted to exceed the current and proposed desired future conditions (DFCs) by 200-300 feet of drawdown for the Simsboro Aquifer by 2060 (see Table 3 from Rice Report), and will decrease flow in the Colorado River (see Figure 1 below). Figure 1. 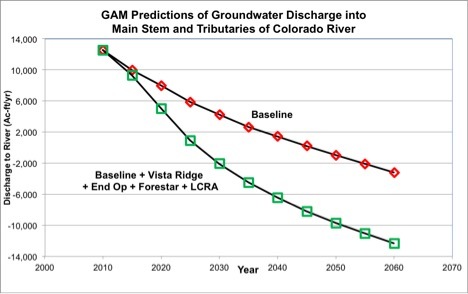 GAM prediction of reduced groundwater discharge to the Colorado River and tributaries. Rice used the same groundwater availability model (GAM) as is used by the groundwater districts. Baseline pumping data were provided by the Lost Pines GCD and included baseline pumping in Lost Pines and Post Oak Savannah Groundwater Districts. Additional pumping by Vista Ridge, End Op LP, Forestar Real Estate Group, and the Lower Colorado River Authority were added to the baseline pumping to predict the combined impacts of Simsboro pumping throughout the region. Reduce hydraulic heads (i.e., water levels or hydraulic pressure) in the Hooper, Simsboro, Calvert Bluff and Carrizo aquifers. Where these aquifers are confined, the reduced heads would cause water levels in wells to decline. Where these aquifers are unconfined (recharge areas), the reduced heads would cause dewatering of portions of the aquifers. Reduce groundwater discharge to the Colorado River, thereby reducing its flow. Additional pumping by Vista Ridge, End Op, Forestar, and LCRA would result in greater head reductions than would baseline pumping alone, and a greater decrease in groundwater discharge to the Colorado River. 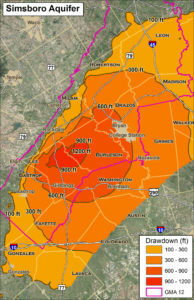 Below are drawdown maps showing the impact of baseline plus additional pumping in the Simsboro Aquifer, and the direct affect of the Simsboro pumping on the Hooper, Calvert Bluff and Carrizo aquifers. (The southeast boundaries of the aquifers shown on the maps are limited by the extent of the GAM model. It is likely that the drawdowns extend further into the counties south and east of the drawdowns lines shown on the maps). Figure 2. GAM predicted drawdowns in the Simsboro Aquifer due to baseline pumping plus additional pumping by Vista Ridge, End Op, Forestar, and LCRA 2000-2060. Figure 3. 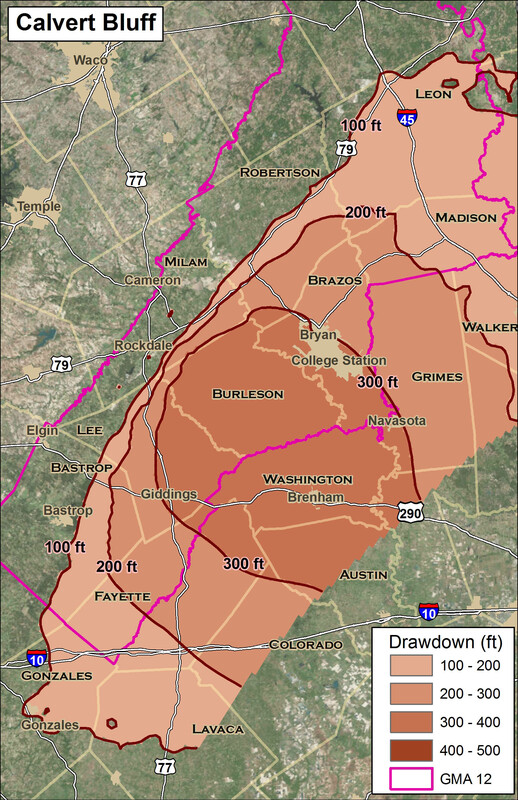 GAM predicted drawdowns in the Hooper Aquifer due to baseline pumping plus additional pumping by Vista Ridge, End Op, Forestar, and LCRA 2000-2060. Figure 4. 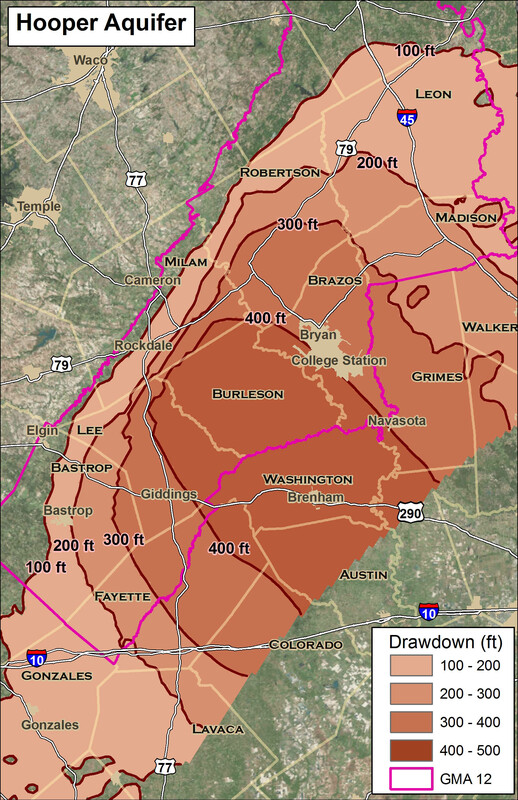 GAM predicted drawdowns in the Calvert Bluff Aquifer due to baseline pumping plus additional pumping by Vista Ridge, End Op, Forestar, and LCRA 2000-2060. Figure 5. GAM predicted drawdowns in the Carrizo Aquifer due to baseline pumping plus additional pumping by Vista Ridge, End Op, Forestar, and LCRA 2000-2060.